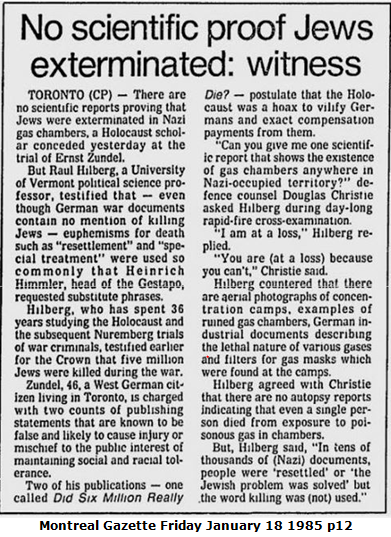 At Ernst Zundel's "False News" trial, Holocaust expert Raul Hilberg couldn't provide the proof he had testified existed for the 'Holocaust.' Zundel was acquitted. But today he's still considered guilty by the 'Industry' and by ignorant Alt-Right leaders. THE ALT-RIGHT IS A DEAD-END BECAUSE IT TAKES THE WRONG STANCE on the alleged “holocaust of the jews” – it accepts this "holocaust" as an irrefutable fact of history. It also accepts Jews into its own ranks and sees them as a permanent fixture in White countries. This is true of all those who accept having the term Alt Right applied to themselves: Richard Spencer and Daniel Friberg; Kevin MacDonald and Tom Sunic; Jared Taylor, Greg Johnson, David Duke, Henryck Palmgren and Lana Lokteff of Red Ice, and some of the writers at VDare to name just a few that come to mind. Andrew Anglin is not above using the talents of Jews (Andrew Auernheimer) but does not accept the holocaust. He calls himself Alt-Right because he wants to belong to the club, but I don't consider him such. These people have no problem at all with homosexuals in their movement and speaking from their platforms, either. MEDICAID SEEMS MADE TO ORDER FOR jEWS TO TAKE ADVANTAGE OF. Now I've learned of the connection between the Hasidic Orthodox community of Kiryas Joel that recently gained voter approval to become an independent town adjacent to Monroe, NY, and a health clinic in Milwaukee, Wisconsin. The Jewish Racket is this: First make the most vulnerable among us depressed, addicted and ill; then supply the government-funded “help” to treat their illness. And make millions for yourself. 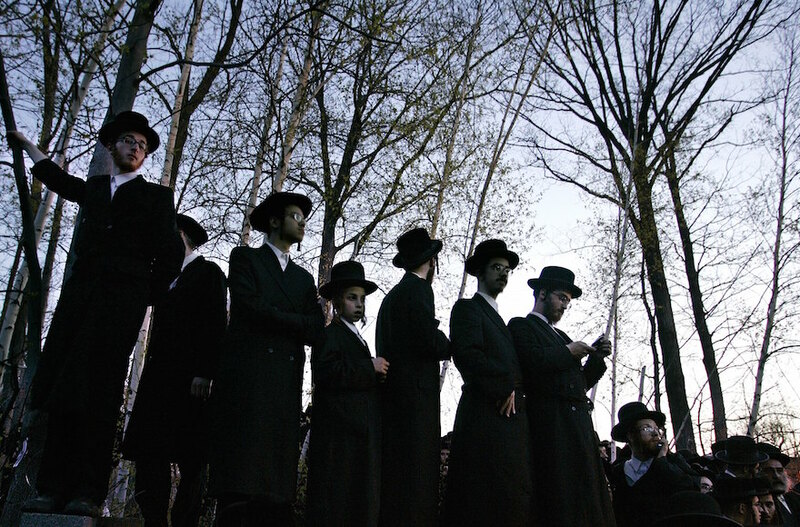 The Hasidic community of Kiryas Joel reportedly will become the first haredi Orthodox town in the United States after voters in Monroe, New York, overwhelmingly backed a referendum on secession. On Tuesday, over 80 percent of Monroe voters backed the measure on Kiryas Joel, a village of over 20,000 Yiddish-speaking Jews associated with the Satmar Hasidic sect, to form the state’s first new town in 35 years. The Town of Palm Tree — an English translation of the Satmar rebbe’s surname, Teitelbaum — should come into existence in 2020, unless lawmakers speed up the process. 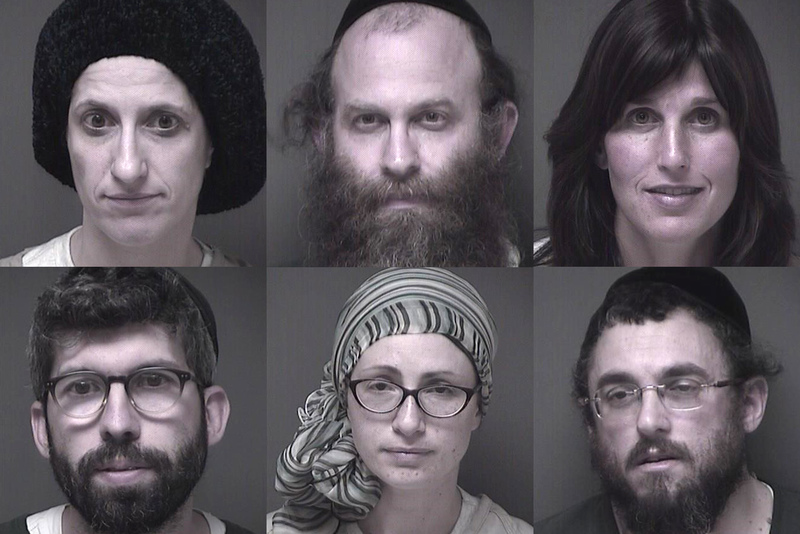 Six of the 26 Orthodox Jews arrested for substantial welfare fraud during the June-July sweep by the New Jersey Ocean County prosecutor's office. Don't you think these people should be in Israel? ON SUNDAY, OCT. 22, I HAD THE PLEASURE of speaking with John Friend again on his Realist Report podcast. We discussed the situation in Lakewood, New Jersey (see my posts for Oct. 19 and Oct. 21 on this page) and how it is a prime example of the way Orthodox Jews living in White democratic societies subsidize their traditional life of male religious study by cheating our generous welfare programs. The dysfunctrional Lakewood School Board meets: left to right, Orthodox Jewish President Barry Iann (just quit); Jewish board attorney Marc Zitomer (now replaced); Vice-president Ada Gonzalez (status unknown). AND WHEN YOU GET HUNDREDS OF THESE FAMILIES in one school district, as is the case in Lakewood NJ, the burden is unsupportable. Further, the city government projects that its current population of more than 100,700 will reach 220,000 by 2030, an increase made up entirely of ultra-orthodox Jews. The biggest problem that comes with ultra-orthodox Jewish families that have 5 to 10 children each is the higher incidence of “special needs” individuals among them. Lakewood women have the highest birth rate in the state with 4,000 births per year. A higher than normal percentage of these births are children with disabilities that occur more commonly among the Jewish Orthodox than among the non-Jewish population. I previously wrote about this most specifically in my July 30 post; please read or reread it. HAVE YOU WONDERED WHAT HAPPENED in the Lakewood NJ welfare fraud scandal? Amnesty! The New Jersey state comptroller's office [Philip Degnan at left] has designed an amnesty program to deal with the Orthodox Jews who, out of the 50,000 now living in Lakewood, applied for and took Medicaid benefits that they were not fully entitled to. Recall that in June and July, 26 Orthodox Jews (all married couples) were arrested for taking more than $2 million in public assistance they weren't entitled to. They included a prominent rabbi and his brother, business owners, and students at the local yeshivas. After these 26, the arrests stopped and the shocked township residents waited to see what would happen next. I posted about this unique American story on five different occasions, on July 1, July 5, July 13, July 21 and July 30. Then I, too, waited. The "Holocaust" is meant to hold the western world hostage to demands from the Jews. Why do we so stupidly go along with it? That is what we need to work on. HOLOCAUST WAS INVENTED BY JEWS, is a tool used by Jews, and Jews have no intention of giving it up … ever. In the Jewish view of criminal antisemitism, holocaust denial is the worst antisemitic crime of all. They unleash all their forces to combat it. Look what they did to the recently deceased Ernst Zundel (right), whom they saw as the most effective spokesman/activist against their official narrative of all the revisionists. The type and level of persecution this man suffered (eight years in prison, much of it in solitary confinement) was noticeably out of proportion to his simple publishing of a book that questioned the number of 6 million “Jewish victims.” In response to their taking him to court in Canada under that nation's "hate laws", the enterprising Zundel sent execution specialist Fred Leuchter to Poland to prove the “homicidal gas chambers” were a fraud, which Leuchter did. Because he exuded sincerity and decency, Zundel was able to raise hundreds of thousands of dollars from his supporters. This all made Zundel enemy #1 to the Jewish Power club. When are White people going to stop making Jews rich? Harvey Weinstein (standing), Michael Kors (center seated) and Donna Karan (right) share a joke at the amfAR New York Gala in 2010. AmfAR is The (American) Foundation for AIDS Research. Could that be Kors' partner at left? HERE IS A PICTURE OF THREE very successful Jews yukking it up at a New York Gala in 2010. We all know Harvey Weinstein, a celebrity Jew movie producer. Stein is pronounced like “mine,” as in a stein of beer, but for some reason, probably because they think it sounds less Jewish, Jews want to pronounce it as “steen.” So everyone in media does. Isn't it odd though, that 'wein' and 'stein' are spelled the same, but we don't say “Weensteen”, do we. Read more about When are White people going to stop making Jews rich? Former Belgian MP Laurent Louis has been sentenced to the humiliation of visiting Holocaust Memorial "camps" each year for five years, writing a 50-line report about his feelings and keeping it posted on his Facebook page. WHAT HAPPENED TO LAURENT LOUIS CAN HAPPEN TO YOU, too, if Jews get their antisemitism laws passed. According to ejpress.org (European Jewish Press), the former Belgian MP who was convicted for “negationist” comments and statements has been “condemned to visit a number of concentrations camps” once a year for five years, and write at least 50 lines on “what he saw and what emotions he felt,” then keep it posted on his Facebook page, in lieu of a prison sentence.